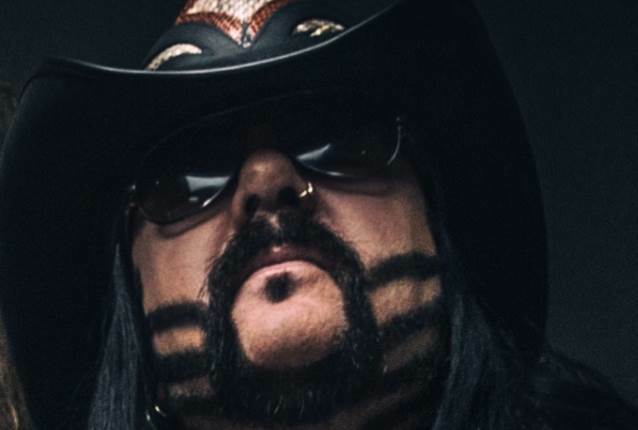 The first photos of Vinnie Paul Abbott's final resting place can be seen below. The PANTERA and HELLYEAH drummer was buried on Saturday (June 30) next to his brother, PANTERA guitarist "Dimebag" Darrell Abbott, and their mother, Carolyn, at Moore Memorial Gardens cemetery in Arlington, Texas. He was laid to rest in a custom "Kiss Kasket" provided by KISS members Gene Simmons and Paul Stanley. The casket was offered as a gift at Vinnie's family's request. Vinnie was also buried in some of his trademark clothes, including his hat, shoes and flannel. A public memorial for Vinnie Paul will be held later today (Sunday, July 1) at Bomb Factory in Dallas, Texas. Fans interested in attending "Vinnie Paul: A Public Celebration Of Life" must receive a wristband to enter the Bomb Factory. The line for wristbands began at noon outside the venue prior to the 3:33 p.m. memorial. PANTERA fans will know 3:33 p.m. as "Dime Time," in honor of Dimebag. Vinnie Paul explained in a 2006 interview: "[Dimebag's] number was three, you know. And every day, 3:33 will appear on the clock, and I don't even mean to look at it, and it just reminds me of him every day. It doesn't matter if it's at night or during the day. I'll be doing something. I'll be right in the middle of something, busy, busy, busy, and I'll look over, and by gosh it's 3:33." Brothers finally together ? #vinniepaul #dimebagdarrell #pantera ??? ?